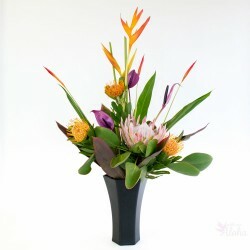 A rich mixture of beautiful stems with a bit of everything for the tropical flower lover. 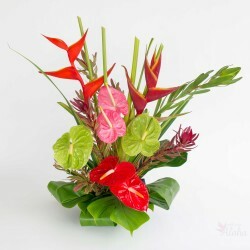 Tall red gingers with tropic fleur heliconia join red and green anthuriums. We complete the selection with orchid sprays. 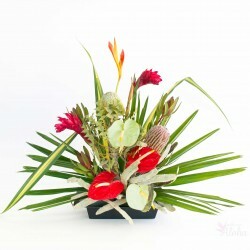 Also included are ti leaves and raphis palm to bring greenery to one of our most varied assortments. 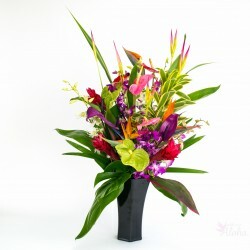 Hoaloha is one of our more popular assortments. 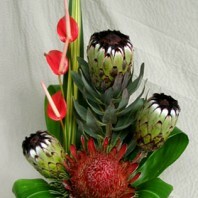 It represents the essential Hawaiian flowers most often used in arrangements. 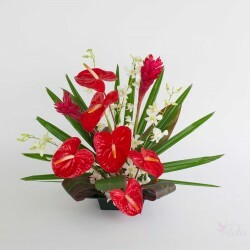 The tropical flowers in this selection are long lasting. They will remain bright and colorful for a week or more. 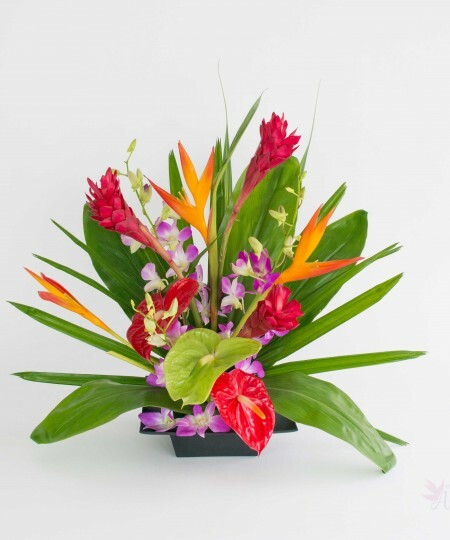 The bright red gingers are the tallest of the Hawaiian flowers in this mix. 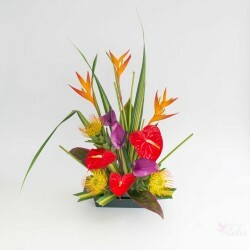 Also included are yellow tropic fleur heliconia. These flowers will add height to your assortment. The yellow complements the reds of the ginger and of the anthuriums. 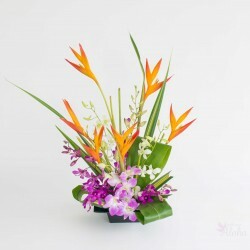 An assortment of orchid sprays adds more colors and texture. 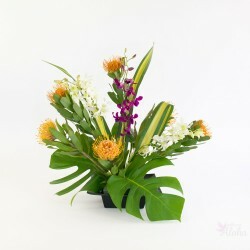 Orchid blooms are smaller compared to the other flowers in this tropical mix. 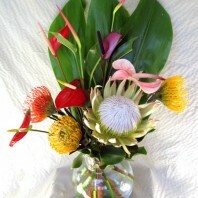 Anthuriums and orchids can be left tall or cut shorter for fill. For greenery we include a fan shaped raphis palm leave. This works well at the back of the flower arrangement. Wide deep green ti leaves fill in the rest. 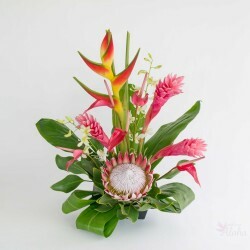 All in all the ‘Hoaloha’ is a balanced assortment with Hawaiian flowers of all sizes, colors and textures. 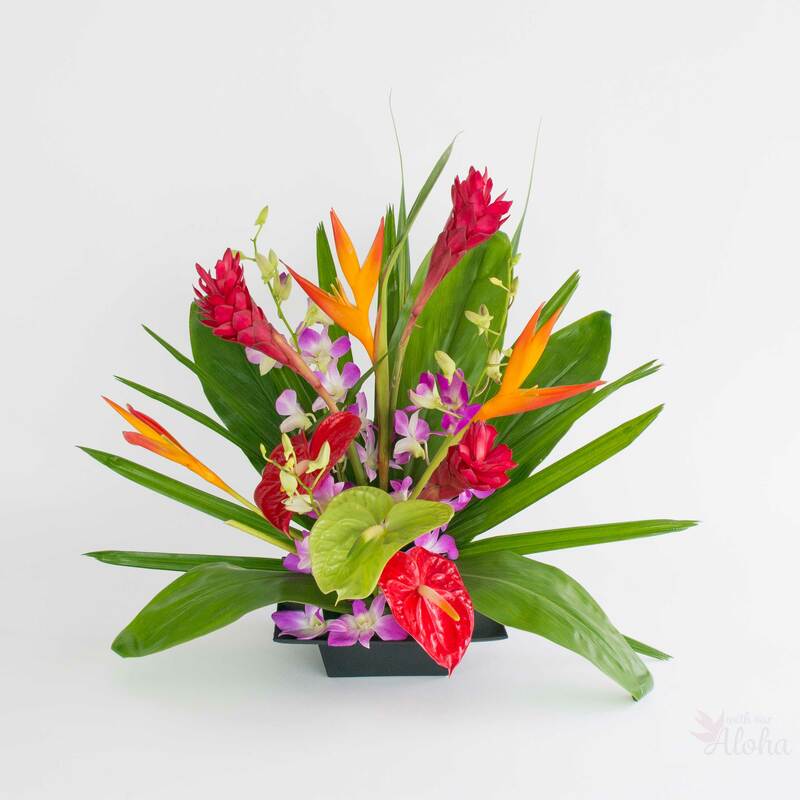 Express your friendship, gratitude, congratulations and more when you send flowers in this Hoaloha ‘Good Friend’ assortment. Available all year around. Our simple care instructions are included in every order. Our flowers are sent as full length stems. Arrange to your liking. Last minute orders are subject to substitutions. This is our Flowers of the Month selection for September.